This collar sleeveless shirt dress in tan was one of my most recent purchases from Topshop, along with the ring i'm wearing. The dress fits real nicely and goes in at the waist. I wouldn't usually buy an item of clothing like this, but i've seen lots of people talk about these shirt dresses so when i went shopping i was eager to try it on. Let's just say it was love at first sight! Seeing something infront of you, being able to feel and examine the material and actually see how it looks on you most definately beats online shopping any day! Had totally forgotten what it was like to go shopping, it'd been SO long. I've left the top button undone because it looks rather ridiculous on me specifically when done up. Also.. hello white nails! Definately my favourite colour to paint my nails at the moment. 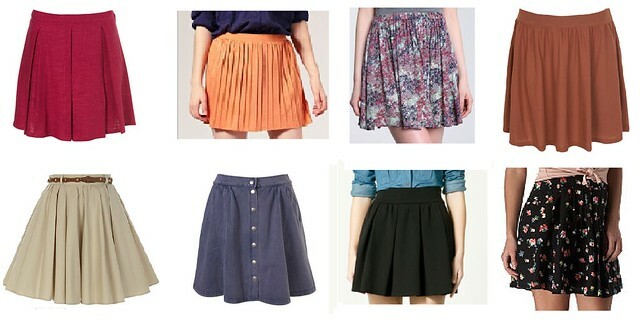 On of my favourite items of clothing at the moment, has to be skirts. They're just so easy to wear and can be dressed up or down in the space of a couple seconds if the accessories are adjusted. Personally, my favourite at the moment have to be flippy skirts as oposed to tube skirt. Feel so much more relaxed in flippy skirts, feel a lot more relaxed and feminine too, whereas in a tube skirt, i feel very concious as they're so skin tights. Perfect for the summer approaching too, here are some of my favourites which i've come across. TOMORROW I WILL ANNOUNCE THE WINNER OF MY GIVEAWAY! I'm loving skirts at the moment too, I need to buy a few more new ones though!! Looking lovely my dear. Hope your feeling better. You look gorgeous btw, you don't look ill at all! You must look stunning when you're not ill! I really want to try a white nail polish. How good is the Models Own one? That is a gorgeous outfit I love polka dots so much :) so cute! I'm sorry you've been feeling ill hope you feel much better soon! That dress suits your frame so well! beautiful! The colour suits you well too, and I have that cardie.. so warm and cosy isn't it! love your outfit. the polka dots are so fine. I've been wanting to see what that dress looks like on. I've been admiring it myself. Looks great. I love this dress :) I;ve had my eyes on it rather a lot lately- going shopping very soon, so will see what happens!! The dress is so cute, love it! you look great in these pictures girl! you don't see anything:) I like how you make your pictures outside now! really great backround aswell.. lovely dress. YEAH SO, i will be borrowing that!